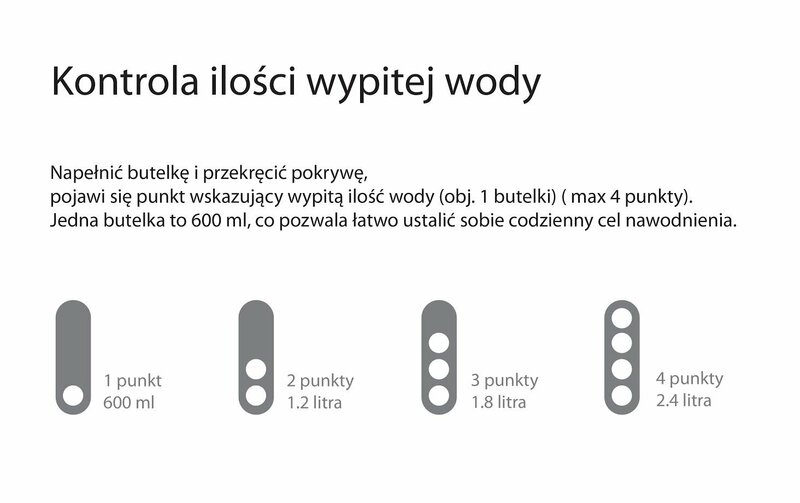 Volume: 0.6 l. Has a water intake indicator - the next point appears after each time you fill the bottle up. Taking a decision today, somehow you decide on your future. Is there anyone who hasn’t heard of proper body hydration? Why do so many people still drink too little water or replace it with, e.g. fizzy drinks? The answer to such questions can be the fact that a large part of population doesn’t pay attention to proper body hydration. That’s why they can feel distracted, have frequent headaches and other disorders. How should we prevent such things? Remember to drink water often. To remind you of this important habit, I designed the HPBA Dot bottle. Its greatest advantage is a very useful indicator on the cap - the next point appears after each time you fill the bottle up. Thanks to that, you know how much water you drink a day. Do you lack motivation? Look at the slogan at the front and... never give up! the bottle is dishwasher-safe, the cap is hand wash only.